Ohio State is 3–0 all-time against against Rutgers and is 1–0 as the away team. This is the sixth time Ohio State has played in the state of New Jersey. The Buckeyes competed in the Kickoff Classic three times. The results of the Kickoff Classic games were a loss to No. 12 Miami in 1999, a defeat of No. 22 Boston College in 1995 and a loss to Alabama in 1986. The first game in New Jersey was a loss to Princeton in 1927. Ohio State played Rutgers, the Buckeyes won 58-0. The Buckeyes played in Piscataway, No. 1 Ohio State won 49-7 and a cannon crew became famous. OSU played a season without playing Rutgers was 2013. The Scarlet and Gray lost to Rutgers was...never. Ohio State played game 5 on the road was 2015. The No. 1 Buckeyes escaped Bloomington with a 34-27 win over Indiana. The Buckeyes lost a game 5 away tilt was 2005. No. 6 Ohio State lost to No. 16 Penn State 17-10 in Beaver Stadium. OSU lost to a non-conference opponent in game 5 was in 1947 against Pittsburgh. The Panthers won 12-0 in Pitt Stadium. This was also the last time Ohio State played a non-conference opponent in game 5. Bowl Game: Did not play. Coaching Status: Chris Ash (2–10) 2nd season. QB Chris Laviano recently transferred to San Diego State. He had his best season with the Scarlet Knights in 2015 when he threw for 2,247 yards and 16 touchdowns. Last year wasn't as productive as he compiled 748 yards and 5 touchdowns and lost the starting job to Giovanni Rescigno. RB Justin Goodwin was second on the team with 527 rushing yards and third with 22 receptions. DB Anthony Cioffi was signed as an undrafted free agent by the Oakland Raiders. He the led Rutgers with two interceptions and was third in tackles (64). This is the 13th time the Buckeyes have played on September 30th. No. 1 Ohio State defeated No. 13 Iowa 38-17 in Kinnick Stadium the last time the program played on this date. The Buckeyes are 7–2–1 when facing unranked opponents on September 30th. This will be Ohio State's third road game on this date. The first game the Buckeyes played on September 30th was a 22-16 loss at Otterbein in 1893. Ohio State is 84–33–8 in the fifth game of the season an is 41–16–1 when playing the fifth game on the road. 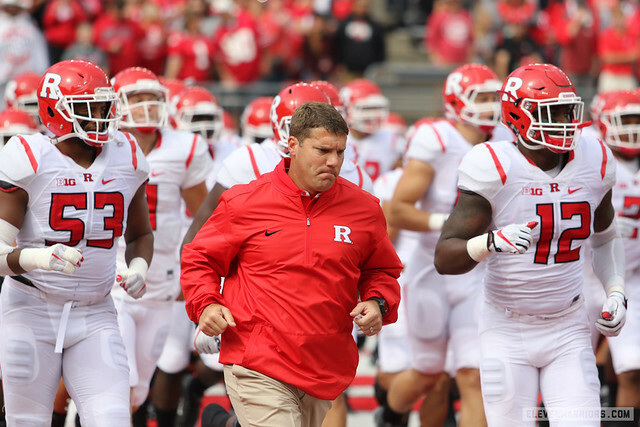 Chris Ash finished his first season at Rutgers with a 2–10 overall record and was 0–9 in the Big Ten. The Rutgers football program has never defeated the following Big Ten teams: Iowa (0–1), Minnesota (0–1), Nebraska (0–3), Ohio State (0–3), Purdue (0–0) and Wisconsin (0–2). The Buckeyes are 9–1 in their last ten game five contests. Michigan State (2011) was the loss.